Went for a fish on a ridiculously windy day. We had to change a few destinations before we found one that was going to shelter us from the wind. Our spot was dead quiet for most of the day. All of a sudden just before sunset, our small bit of fish bait was hit by a steam train! 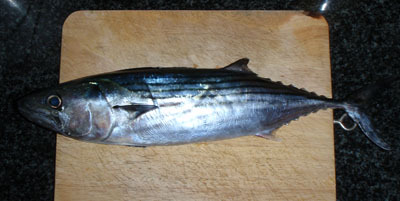 After a fight of few minutes, what we thought was a slimy mackerel, turned out to be our first bonito! The rest of the day, there were schools of fish coming through and even the odd kingfish! A few took our baits and went for a run and ended up busting us off each time as we only had 10lb line. Was a bit disappointed not to have landed our first landbased kingfish!